Every Christmas, I have visions and hopes of a cookie baking extravaganza. And every Christmas, other things (work, visitors, forgetting to buy sugar, general laziness) seem to get in the way…not only is there no baking extravaganza going on in my kitchen, there is not a single cookie to be found. 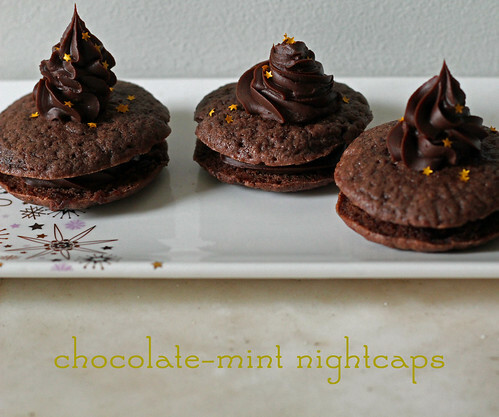 I try my best not to poop out on TWD each week, and lucky for me these Chocolate-Mint Nightcaps from Marcel Desaulniers are, ya know, seasonally flavored. I think I’ve finally make a Christmas cookie– yay! These are little cocoa sandwich cookies, filled and (night)capped off with a squiggle of dark chocolate and mint ganache (the recipe calls for steeping fresh mint, but a drop or two of peppermint extract is what I used in its place). Before I had even read the recipe, I made the assumption that the cookies would have a fauxreo thing going on…I was a little surprised that I wound up with a cakey batter when I mixed the dough. I made these late in the day and sandwiched a few as soon as they’d cooled. They were so soft and crumbly…even though it was clear that they weren’t going to be crispy wafers, I was not expecting them to fall apart like they did. Kind of of discouraging, but I decided to let the rest of my batch of cookies hang out unfilled overnight. Actually, I decided to let them sleep in the freezer, thinking that would really help them set (whether or not that was necessary, I don’t know). When I put them together with the ganache the next day, they’d firmed up and were like fudgy, minty brownie cookies. Seriously good….I only made a quarter-batch, or I’d definitely leave a couple out for Santa. Looks good. i really love chocolates. Pretty! Yes, I think peppermint would have been good. I made mine with waaaaay too much mint and the ganache tasted like toothpaste! ick. They look great! I love the chocolate and peppermint combination at Christmas time! minty fudge cookies sound soooo good. Love the look of your nightcaps!! Beautiful. The little stars are a nice touch. Good call on using extract. My ganache had no mint flavor to it at all. My Christmas ideas are always grander than my energy 🙂 They look good.